TOTAL ECLIPSE…WHAT IS HAPPENING IN THE HEAVENS? Suppose it were your last hour! What would you choose to be doing? But let me tell you, it is the last hour. God is giving us warnings and signs in the heavens and in the natural. “Little children, it is the last hour…” (1 John 2:18). John penned those words almost two thousand years ago. If John were writing today, he would probably say it is the last seconds of the last hour. If anyone thought they only had an hour left, I seriously doubt they would be concerned about things…they would be concerned about where they would spend eternity and those they love. Living with eternity in mind brings all of life into proper perspective. When I heard about the recent evacuation at the Outer Banks of North Carolina, and the story of a line being cut at a bridge that ushered in darkness and loss of power for three days…my mind thought about the evacuation that will happen in a twinkling of an eye when the Trumpet sounds. When we don’t renew our minds in the Word of God and stay connected in close communion with God, and with other believers, we can live in the world and be unaware of the times. Anyone can lose their power if they live in denial or do not stay plugged into God and His Word. With the power outages and evacuation that occurred due to power lines being cut, I also thought about how the law has been changed to go against God’s Word, and how He is warning America to return and repent. The enemy wants to destroy all mankind through destroying our connection with God. My third book THE MIDNIGHT HOUR (Will America Turn Back To God?) is a wakeup call for everyone. America was founded on God’s Word. Jesus is the bridge for all mankind to heaven…and it is our choice if we receive the gift of eternal life or not. With the next event happening on August 21, 2017, with the narrow path across America where the total eclipse will be visible, I learned that it has only happened once before in 1776. What is significant about 1776? It is the year that is celebrated as the official beginning of the nationhood of America. People are converging from all over the place to watch this total eclipse of the sun. Hotel rates have skyrocketed and mass productions of eyewear are available. People are being warned to check the safety of their glasses as viewing the sun without proper eyewear can cause permanent damage. The constellation that is forming on September 23, 2017 is the first time since Creation. We are getting signs in the heavens of warnings, and those warnings are getting bigger. (Take time to read Revelation 12). In between, on September 11, 2017, is the Feast of Trumpets on the Jewish Calendar. One day the Trumpet shall sound and we will be called to meet the Lord in the air. We are not called to predict dates of the return of Christ. However, we can surely see the signs and warnings for all to repent and be ready for His return. It is obvious that we are much closer to the end every single day. Paul saw it that way too: “Knowing the time, that now it is high time to awake out of sleep; for now our salvation is nearer than when we first believed” (Romans 13:11). The Bible’s message is that our days are “numbered”….not numberless. The Church must awake out of slumber, sleep, and sinful ways and be more concerned with the battle that rages—the war with Satan and the salvation of souls. We have to check our own hearts and be prepared at all times. The Bible says, “Pursue the enemy, and without fail you shall recover all” (1 Samuel 30:8). In THE MIDNIGHT HOUR, you can see the principles that are time tested that still work for today…if we will repent and return. David wept before the Lord, he worshiped, he inquired of God, and God gave him strategic instructions….David obeyed and recovered all. We also know David was also the one who chose to tackle the enemy. First Samuel 17:48 says that David “ran” toward the Philistine champion—the Giant. The believer in the army who tackled the enemy was the one who carried the anointing of God. It’s time to stand up, stand apart, and step into battle…with faith in God! Magnify the Lord over all. We must humble ourselves and repent and return to the Lord. The Good News of Jesus Christ, the Gospel, is eternal, but we do not have eternity to preach it….time is short. It is the last hour for someone today. Somebody is crying out to God for help. No one is good enough to make it to heaven on their own. We all are in need of Jesus. He came, he gave His life for all mankind, but we must believe on Him, confess our sin, and experience a heart change. Knowing about God is not enough. If you are not born again, if you are living in sin and you are reading this, it’s not too late. Repent and believe. Read the Bible for yourself. God says, “My people perish for lack of knowledge” (Hosea 4:6). The warnings have hit America. Weather patterns are changing, wars and rumors of wars, increased violence, chaos, confusion, and fake news. Lack of respect for authority to betrayal of all kinds. The spirit of antichrist permeates human thinking and society. It is has created havoc and caused moral collapse. But God… God has His answer. The outpouring of His Holy Spirit is His amazing and special provision for the last hour. No one knows when the Trumpet will sound…no one knows when the Church will be caught up to be the with the Lord in the air. When that evacuation occurs, everything will change forever. All of The Feasts of the Lord are appointed to a certain day. When the stars and planets are lining up, these are signs in the heavens from the Lord. God does say, “Surely, the LORD GOD will do nothing, unless He reveals His secrets to His servants the prophets” (Amos 3:8). God sends warnings. He warned the people through Noah of the flood that was coming. He warned Pharaoh by Moses. The list goes onward. He is still warning. He warns through dreams, visions, His Holy Word, through His Servants, and through signs in the heavens. He goes to extreme measures to get our attention. “And it shall come to pass afterward that I will pour out My Spirit on all flesh; …before the coming of the great and awesome day of the LORD” (Joel 2:28, 31). The Body of Christ, armed with the Word of God, will be mobilized for the last onslaught of the enemy. Satan will lose again. We know the end of the story. “So the great dragon was cast out, that serpent of old, called the Devil and Satan, who deceives the whole world; he was cast to the earth, and his angels were cast out with him. Then I heard a loud voice saying in heaven, “Now salvation, and strength, and the kingdom of our God, and the power of His Christ have come, for the accuser of our brethren, who accused them before our God day and night, has been cast down.” (Revelation 12:9-10). That’s a good ending. If you are born-again, witness to your family, friends, and foes. Walk in God’s love. Sow mercy and grace. If you are not sure, or if you are caught up in sin, repent and return to the Lord. Don’t allow darkness to cover your heart. 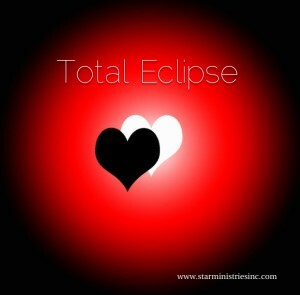 The total eclipse that is coming is a warning for every person to make sure their heart is right before the Lord. Light and darkness do not mix. Check your own heart. This is the heart of our heavenly Father God—for those who will hear. He loves YOU with an everlasting love. Worship His holy name! 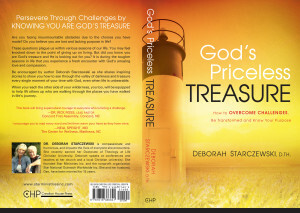 GOD’S PRICELESS TREASURE (How To Overcome Challenges, Be Transformed and Know Your Purpose)….learn how to move from drama to destiny, from a mess to a message, from pain to purpose, from trials, tribulation, and trouble to TRIUMPH through turning to Jesus Christ. A LEAP OF FAITH (25 Days At The Mercy Seat)….the full account of God’s miraculous intervention—God raised my husband from death, healed him from two strokes, and walked with us supernaturally through two open-heart surgeries and 25 days at Mercy Hospital. He gave signs in the natural to reveal His hand at work behind the scenes. This story will keep you turning the pages—and give you hope and faith to believe God for yourself, for your family, and the nations. Make your words count. Do what is right in the sight of the Lord…always. “Moses finished reciting all the words” (Deuteronomy 32:45). He said to them, “Take to heart all the words I have solemnly declared to you this day, so that you may command your children to obey carefully all the words of this law. They are not just idle words for you—they are your life. By them you will live long in the land you are crossing the Jordan to possess” (Deut. 32:46-47 NIV). These are powerful words from God. God takes care of his own. He is long-suffering, but God makes the records straight. The Holy Spirit reveals all hidden truth and shows us things to come. We are in the hands of the one who fed the hungry multitudes, and beckoned weary hearts to rest. We are in His hands, those pierced hands, once nailed to Calvary’s tree, where Jesus paid the price in full…for you and me. Jesus came to set us free. He wants us to be made whole so we speak life to all we meet. Moses knew it was the end for him; we may not know when our end is at hand…when we will draw our last breath. Any word of our ours…may be our last. What will people remember you by? Your encouraging words, godly counsel, or yelling and screaming and pitching a fit? If we always thought about our words, that they could be our last, would it not make us more careful? Would we ever say an unkind word to our spouse, our parents, our children, or to a friend who has stood by us through thick and thin? Would we say an unkind word to a dear friend who was perhaps a little short in their attitude, only to find out they had terminal cancer and were sick? Would we ever say an unkind word if we felt we may not have the opportunity to make it right? Would we ever utter an unclean, angry, or untrue word if we knew it would be our last? Surely we all want to have beautiful endings to our life, to leave a legacy of sweet memories behind in the hearts of our family, friends, and those who love us. We want the memory of our final words to leave a heartfelt, tender joy with those we love as the days pass. Only by making sure that every word we speak glorifies God can we be certain our last words will be beautiful memories. For with any goodbye on the phone, to any sentence we speak to family, friends, neighbors, and those around us, we may come to the end of our days. Make your words count…for all eternity. Pray to God to keep a pure and tender heart. Bring joy to all you meet. 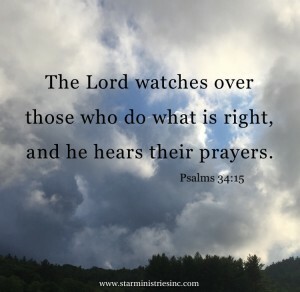 “The Lord watches over those who do what is right, and he hears their prayers” (Psalm 34:15). GOD’S PRICELESS TREASURE (How To Overcome Challenges, Be Transformed, And Know Your Purpose)….learn how to move from drama to destiny, from pain to purpose, from tragedy and trials to triumph through turning to Jesus Christ. A LEAP OF FAITH (25 Days At The Mercy Seat)…the amazing story of God raising my husband from death, healing him from two strokes, and two open-heart surgeries….25 days at Mercy Hospital…how the Holy Spirit led us and comforted us through it all. THE MIDNIGHT HOUR (Will America Turn Back To God? )….we are on God’s prophetic timeline for the return of Jesus Christ, for His rule and His reign. A must read for all….a perfect gift for loved ones and friends.